Philadelphia – January 11, 2017 – Below are the ten most widely read articles published by the Middle East Forum and its staff and fellows in 2017. The selections – six research manuscripts and four op-eds – reflect heightened reader concerns about mass immigration, counter-terrorism, the Iranian nuclear threat, the Arab-Israeli conflict, and the Muslim Brotherhood. All are worth a (re)read. Middle East Quarterly editor Efraim Karsh dispels the myth that the Balfour declaration was an act of imperialist aggression that caused the Israel-Palestinian conflict. The declaration, he notes in the Winter 2018 issue of Middle East Quarterly, was endorsed by the League of Nations, mirrored by an official communiqué of the Ottoman Empire, and accepted by Arab leaders and ordinary Palestinians, who "preferred to coexist with their Jewish neighbors and take advantage of opportunities created by the evolving Jewish national enterprise." It was the ascendancy of Hajj Amin al-Husseini and other extremist Palestinian leaders in the 1920s and 1930s that ignited decades of conflict between Jews and Arabs. Consequently, Karsh writes, "it is only by shedding their century-long revanchist dreams and opting for peace and reconciliation with their Israeli neighbors that Palestinian leaders can end their people's suffering." 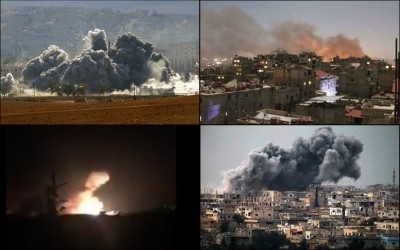 Israel has struck pro-regime facilities and convoys in Syria dozens of times during its six-year civil war. In this article for Foreign Policy, MEF fellow Jonathan Spyer discusses Israeli concerns about the steady growth of Iranian militia power in Syria and the "free rein that all the major players there seem willing to afford Iran and its various proxies." According to Spyer, the Trump administration "has done little to assuage Israeli concerns about the Iranian advance in Syria." Consequently, Israel will "take the measures it deems necessary to halt or deter the Iranians and their proxies." 8. Obama's Legacy, a Nuclear Iran? Emily B. Landau, a senior research fellow at The Institute for National Security Studies (INSS) in Tel Aviv, argues that the Obama administration's negotiation of the Joint Comprehensive Plan of Action (JCPOA) with Iran not only produced an agreement that "opens the door to the terrifying prospect of a nuclear Iran within ten to fifteen years," but also led it to acquiesce in Iran's expanding regional influence. As a result, Obama left the Middle East "a far more dangerous place than it was eight years ago." Although it is commonly said that history is written by the victor, the last half century has witnessed a "historiographical rewriting" of the 1967 Six-Day War "by the losers and their international champions," writes Gabriel Glickman in the Summer 2017 issue of Middle East Quarterly. Israel's preemptive strike against Egypt has been recast as an act of aggression, not self-defense, and Egyptian President Gamal Abdel Nasser has been recast as a victim of circumstance who didn't want war. This retelling of the war has "effectively become the received dogma, echoed by some of the most widely used college textbooks about the Middle East." 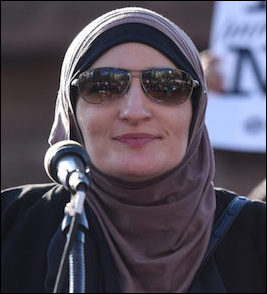 Middle East Forum President Daniel Pipes examines the meteoric rise of Linda Sarsour, the hijab-clad Muslim American activist who has become the darling of the progressive left. He concludes that her "long record of incompetence, extremism, vulgarity, and eccentricity" make her a liability to her leftist allies. "If she's their vaunted star, conservatives can rest easy." Middle East Quarterly editor Efraim Karsh argues in the Summer 2017 issue of Middle East Quarterly that another all-out Arab-Israeli war was already "a foregone conclusion" by the time of the 1967 Six-Day War due to unwavering Arab rejectionism, and that Egyptian President Gamal Abdel Nasser's "belief in Egypt's ability to absorb an Israeli strike and still win the war" led to his threatening mobilization and closure of the Straits of Tiran on the eve of the conflict. 4. What's on the Mind of a Muslim 'Refugee'? MEF fellow Burak Bekdil considers the question of why "millions of Muslims are trying, through dangerous means, to reach the borders of a civilization they have historically blamed for all the world's evils." He finds that the pull is overwhelmingly economic. Even those originating from Syria and other war zones embarked on the treacherous journey to Europe mainly from the relative comfort of refugee camps in Turkey, and "almost all" are determined to bypass welcoming countries after landing in southern Europe in order to get to Germany, "where they have heard from friends and relatives that they will be the best paid." MEF fellow Raheem Kassam recounts his visit to Sweden to inspect three areas with largely foreign-born populations and reputations abroad as "no-go zones" – the Rosengard district of the city of Malmö and the Stockholm suburbs of Rinkeby and Husby. "Perhaps these areas aren't truly 'no-go zones' for someone like me, broadly minding my own business and chatting with local shop owners," he concludes. "But for young women, for police and other emergency services, you take your life into your hands when you enter these areas." 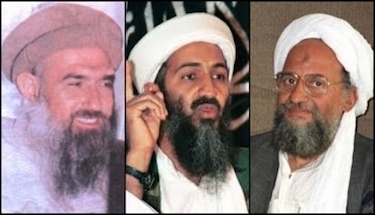 Al-Qaeda founders Abdullah Azzam (left), Osama bin Laden (center), and Ayman Zawahiri (right) were once Muslim Brotherhood operatives. Challenging the Obama administration's belief that the Muslim Brotherhood is a moderate alternative to violent extremism in the Islamic world (then-Director of National Intelligence James Clapper famously called it "largely secular") in the Spring 2017 issue of Middle East Quarterly, Middle East Forum Writing Fellow Cynthia Farahat comprehensively surveys the Brotherhood's role in the establishment of most modern Sunni terrorist organizations, including ISIS, Hamas, and al-Qaeda. In response to President Trump's call for banning entry into the United States by foreigners who "bear hostile attitudes toward it and its founding principles," Middle East Forum President Daniel Pipes outlines a procedure for weeding out Islamists using in-depth research and intensive interviews in the Spring 2017 issue of Middle East Quarterly. He provides a list of 93 suggested questions. The Middle East Forum promotes American interests through activist, intellectual, and philanthropic efforts. Related Topics: History, Immigration, Israel & Zionism receive the latest by email: subscribe to the free mef mailing list This text may be reposted or forwarded so long as it is presented as an integral whole with complete and accurate information provided about its author, date, place of publication, and original URL.